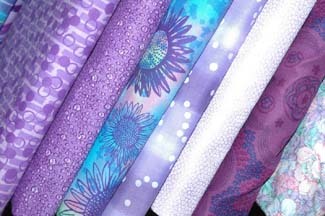 Do you enjoy quilting just as much as, if not more than, scrapbooking? Me too! Why not join the two?! Here are some great scrapbooking page ideas that will cleverly display your quilt projects. My mother taught me how to quilt when I was in high school. Shortly after I started my good friend gave me a Quilting Journal as a gift. The Quilt Journal has space to record the day you started and finished the quilt, who the quilt was made for, an area to describe your inspiration, the pattern, color and your thoughts of the quilt. There is also a place for a picture and fabric swatches. The Quilting Journal is so wonderful BUT, why not have a Quilting Scrapbook by using the same idea as the journal? If you are really motivated, make an extra quilt block to include on your page. If your quilt block is 12 x 12, or if you can adjust it to become that size, you could use it as the page's background. Or try my favorite way to display a sample block; size the quilt block down to serve more as an embellishment. For example, if you had a block with 2 inch stripes (that is 1 1/2 inch finished) make a block with 1 1/4 inch strips (that is 3/4 inch finished). So sweet! Also, try dressing up the page with these quilting stickers by Stickopotamus! Have You Created A Page Displaying Your Quilt? If so, share your page with us!